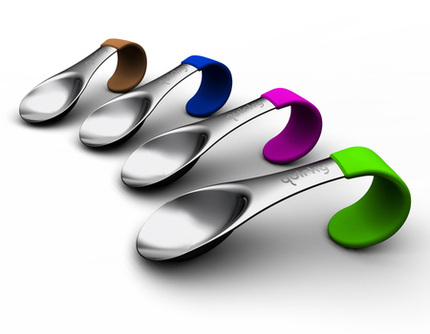 You know they way they say “oh don’t reinvent the wheel”.. well the team at Quirky have obviously taken that to heart, because they have only gone and reinvented the spoon. News about the launch of the Quirky MugStir filled me with deep joy. 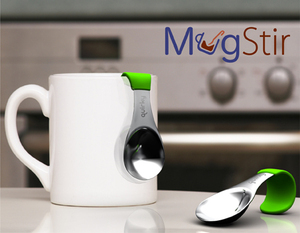 More because rebranding the humble spoon as a MugStir was so innately hilarious than because it is actually a great technological advancement that will improve the world. This PR team could sell anything. I mock – I haven’t tried it yet, and there are some positive comments on the product page in Quirky, though others complain that the bend prevents the spoon reaching to the bottom of the cup when stirring, and that the bend doesn’t always ‘clip’ firmly in place but sort of hangs on the mug and slides around. Well, only one way to find out. But kudos to Quirky for their ethos – bringing community-designed products to production, see more here. ha ha – at least it won’t poke me in the eye if I leave it in the cup while I drink!